Vision Zero is a strategy to eliminate all traffic fatalities and severe injuries, championed by a growing number of local agencies across the United States. Road to Zero is an initiative established by the U.S. Department of Transportation and the National Safety Council in partnership with Federal, State, and local agencies with the aim of eliminating traffic fatalities by 2050. Toward Zero Deaths is the national strategy vision for a highway system free of fatalities. Vision Zero, Road to Zero, and Toward Zero Deaths are the three initiatives working with coalitions at the national, State, and local levels to eliminate traffic-related fatalities across the United States. These initiatives are stimulating policy change and establishing multi-disciplinary partnerships at the Federal, State, regional, and local levels to improve safety for all transportation system users. The zero deaths initiatives, including Vision Zero, are built on the fundamentals of Safe Systems, which is to not accept the loss of life, to design a transportation system that accounts for human fallibility, and to prioritize safety over other transportation system goals, such as roadway capacity. Strategic Highway Safety Plans (SHSs) are a major component and requirement of the Highway Safety Improvement Program (HSIP). The HSIP is a core Federal-aid program with the purpose to achieve a significant reduction in traffic fatalities and serious injuries on all public roads. While the HSIP does not have an explicitly stated goal of eliminating fatalities, its core purpose to significantly reduce fatalities is akin to that of zero death initiatives. States develop SHSPs to advance a data-driven and coordinated approach to safety planning that provides a comprehensive framework for reducing highway fatalities and serious injuries on all public roads. Many States have used their SHSP to adopt the goal of eliminating fatalities. Local communities and regional agencies like Metropolitan Planning Organizations (MPOs) are following the lead by developing similar safety plans to reduce fatalities and injuries. Local and regional safety plans should be consistent with the State SHSP, but they can adopt their own messaging or goals. As part of creating their own identity for a safety plan, an increasing number of local agencies have developed safety plans that are inspired by Sweden's Vision Zero approach first adopted in the 1990s. A foundational element of a safety plan is establishing a vision, such as moving toward zero deaths or eliminating fatalities. This vision is what MPOs and local communities can use to promote a culture of safety. MPOs and local communities are prominently showing their commitment to their vision by developing resolutions and pledge statements that commit their executive leaders (i.e., regional commissioner, county executive, mayor), and agencies to initiatives to improve transportation safety. The public are encouraged to commit to the resolution or pledge, with events or websites that allow the public to view and sign it. Provide an overall coordination role in programming funds for transportation projects and operations. Coordinate projects across communities in a larger geographic area. Facilitate communication between constituent communities. Local communities, while developing their own safety vision and safety plan, are encouraged to actively participate with their MPO in safety initiatives. Local communities are also positioned as leaders in the safety planning process, depending on the needed coordination. Each community can prioritize their own funds for safety investments and can coordinate safety discussions with neighboring jurisdictions. This Transportation Safety Planning and the Zero Deaths Vision: A Guide for Metropolitan Planning Organizations and Local Communities, herein referenced as the Guide, provides references to key information for MPOs and local communities to understand the safety planning process and develop their own local or regional safety plan. It is an easy-to-use reference to support developing, implementing, and evaluating performance-based strategic safety plans for MPOs and local communities. The Guide provides noteworthy practices and examples from other strategic safety planning efforts, including links to detailed references and resources. The Guide also provides information on coordinating safety activities between stakeholders. Recognizing that each MPO or local community is unique, the information presented here is intended as a guideline to consider, tailor, and apply in a way that best meets the MPO's or community's specific needs and context. The Guide is a useful resource for MPOs, local communities, and affiliated transportation agencies and stakeholders new to the transportation safety planning process. Safety stakeholders from the executive-level to the public will benefit from the contents of the Guide. The Guide was developed using a review of national, State, regional, and local community safety documentation. The authors also engaged safety stakeholders that represented MPOs, counties, and cities. The document review and stakeholder engagement provided content tailored to MPOs and local communities, particularly on how the local safety planning process relate to safety planning efforts at the State level. Resources published at the national levelâ€”specifically those relating to the development of State SHSPs and those developed for local safety planning and distributed by the nonprofit Vision Zero Networkâ€”served as key resources to inform the development of this Guide. A review of safety plans from local jurisdictions identified the noteworthy practices documented throughout this Guide. The Appendix provides a complete list of the resources used to develop this Guide. The Federal Highway Administration (FHWA) engaged safety stakeholder representatives from communities with diverse backgrounds and characteristics. They are from nine MPOs, counties, and cities with varying levels of experience in developing, implementing, and evaluating safety plans to help steer the Guide's development. The maturity of the safety plans represented by the safety stakeholders ranged from initial planning efforts to plans that had evolved over multiple years and updates. 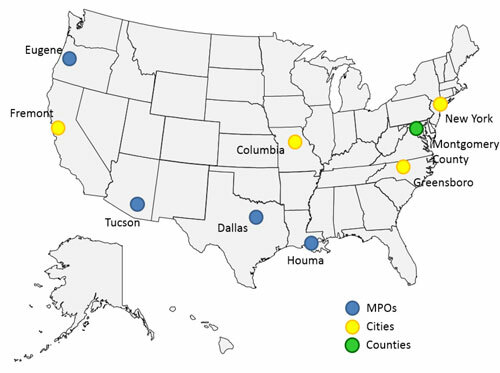 Figure 1 displays the MPOs, counties, and cities that participated as stakeholders. Figure 1. Participating transportation agencies. Chapter 2 provides an overview on the fundamentals of transportation safety planning and the process to develop, implement, and evaluate a safety plan. This chapter is appropriate for audiences who want a general understanding of the safety planning process and its importance. Chapter 3 provides specific considerations for transportation practitioners to develop, implement, and evaluate safety planning. This chapter is designed as a "how-to" guide and includes checklists and examples to help practitioners execute various steps of the safety planning process. This chapter features call-out boxes to highlight safety planning practices including those that are specific to each of MPOs and local communities. This resource contains links to documents and websites that can inform safety planning activities.